The exodus of more than 4 million refugees from Syria since 2011 raises questions about whether Syrian refugee concentrations will become incubators for violent extremist groups. This Perspective takes a preliminary look at nine historical situations in which populations fled violent conflict or repression—in South Asia, East Africa, Central Africa, and the Middle East—several of which became associated with the rise of militant and terrorist groups, to identify the factors in the way refugee situations are managed that are most likely to contribute to radicalization, defined as the process of committing to political or religious ideologies that espouse change through violence. The authors found that factors such as overcrowding, hunger, poverty, and local crime risk refugee alienation and can increase general violence, but specific combinations of factors can be more relevant for predicting the conditions most likely to contribute to radicalization: actions of the receiving country and its citizens, the refugees' loss of personal opportunities in prolonged crises, and lack of integrated programs. In the case of Syrian refugees, the international community has the right ideas to address many of the major risk factors, but comprehensive programs, rare in the historical cases, remain difficult to implement or sustain today. This research was sponsored by the U.S. government and conducted within the Intelligence Policy Center of the RAND National Defense Research Institute, a federally funded research and development center sponsored by the Office of the Secretary of Defense, the Joint Staff, the Unified Combatant Commands, the Navy, the Marine Corps, the defense agencies, and the defense Intelligence Community. 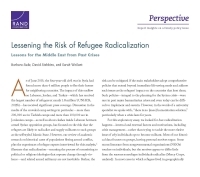 Sude, Barbara, David Stebbins, and Sarah Weilant, Lessening the Risk of Refugee Radicalization: Lessons for the Middle East from Past Crises. Santa Monica, CA: RAND Corporation, 2015. https://www.rand.org/pubs/perspectives/PE166.html.